I confess (might as well, since some of you will likely remember!) that I originally picked up a copy of Chitty Chitty Bang Bang , by Ian Fleming because I thought it was a book that a Disney film is based on. Then I was informed that this is not a Disney movie. But I had still bought the book and that seemed a good enough reason to read it, except now I had considerably less motivation to do so. Then a few weeks ago Candlewick Publishers asked if I wanted to review a new title that is a spin-off of Fleming's book, entitled Chitty Chitty Bang Bang Flies Again . My curiosity was piqued sufficiently and by accepting this review copy, I had suddenly found ample motivation to read the original work and oh, am I ever glad that I did! What an absolute delight! Please, if you have not yet met Chitty Chitty Bang Bang , allow me to make the introduction! "[S]ome motorcars - mine, for instance, and perhaps yours - are different. If you get to like them and understand them, if you are kind to them and don't scratch their paint or bang their doors, if you fill them up and pump them up when they need it, if you keep them clean and polished and out of the rain and snow as much as possible, you will find, you MAY find, that they become almost like persons - MORE than just ordinary persons - MAGICAL PERSONS!!!" Ian Fleming was an English author, journalist and a naval intelligence officer during World War II. He is, just perhaps, a bit more widely known for a certain character he created by the name of James Bond. 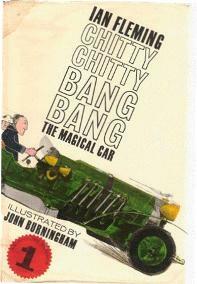 However, his one and only children's story, Chitty Chitty Bang Bang was a hit in its own right. It was first published in 1964 and appeared in three volumes. The story is based on the real Chitty Chitty Bang Bang which was a race car designed and driven by Count Louis Zborowski in the early 1920's. In 1921 Chitty Chitty Bang Bang won the Hundred M.P.H. Short Handicap at Brooklands, clocking in at 101 miles per hour. She won the Lightning Short Handicap again in 1922. In the same year she was involved in an accident, after which Zborowski never raced her again. I can imagine that if you are anything like me when it comes to an interest in cars and driving speeds, the above information is causing your eyes to glaze over. Perhaps you speculate that this is not the book for you. Slow down, my friend, slow down! Hasty assumptions never won good friends and I think Chitty Chitty Bang Bang makes for a pretty decent friend once you give the book a chance! The storyline follows the adventures of the Potts family who live in England. Caractacus Pott is an inventor who invests in an old vehicle that will be sent to the junk yard unless she is rescued. Pott and his family - which includes a wife and two children - find something to like in the old car and they bring her home and give her a fair amount of TLC to get her going once again. Once the refinishing and refurbishing of the car is complete, the family piles in to go for a drive and discover that the car is quite magical. Not only can Chitty Chitty Bang Bang drive, but she can fly, act as a boat should the need arise, and seems to have a mind all her own! The book takes the family on an adventure over to France where they encounter outlaw Joe the Monster and his gang of thieving thugs. They manage to help the police round up the wicked villians in an all's well that end's well manner. The story is so very implausible and so very hilarious at the same time. Flemings writing style is definitely unique. He clearly has some dry British humor and a feel of the journalist about him. Apparently his daily practice was to spend three hours writing in the morning and another hour in the evening. He never went back to revise his work or read what he had already written. What was written was written, what was done was done. His desire was to write thrillers that read like literature and I think he managed to pull it off. He is a clever story teller and I snickered throughout this tale of this amazing and magical car and the unique family who "owned" her. I look forward to reading this book aloud with my kids. I think they'll get a kick out of it. Certainly I never would have expected to enjoy a story about a car so much as I did this one. As Rachel Lynde is want to say, "You're never safe from surprises until you are dead!" So true. Pick up a copy of this book! You aren't likely to regret it! This was one of our recent read-alouds and we enjoy it as well! You'll have to report on whether the sequels are any good! :) Is it appropriate as a read aloud now for your kiddos? I put it (and the $11 bluray/dvd) on my wish list. I have never read this book and never made the connection that he was the James Bond creator. Definitely going on our read-aloud list! I believe I watched "Chitty Chitty Bang Bang" the movie back when I was a kid (maybe? ), but I have no recollection of it. Which I suppose doesn't matter since the two aren't the same. Nevertheless, I am certainly adding this to my list. It sounds like a lot of fun. I remember the film but didn't realize it was based on a book, especially one authored by Fleming of James Bond fame! Sounds like a lot of fun. Ha--Monica loved that movie when we were kids! I don't think I've ever read the book, though. Oh yes! I forgot about this book! I read it with my 'big' kids but need to read it with the littles. Thanks for the reminder! This was my favorite book that my 4th grade teacher read to us. I will never forget her or that book! Lots of fun! Wow! This sounds good. I had no idea Ian Fleming wrote this. Learned something new today.